"Venus" is slightly smaller than the "Earth" and it makes it's circuit around the "Sun" in 225 of our days. Venus has an average distance of 67,000,000 miles to the Sun. Every 19 1/2 months or 584 days, Venus will be nearer to the planet "Earth" than any other planet in our solar system. The planet is covered with a dense, white, cloudy atmosphere that conceals whatever is below it. This same cloud reflects sunlight so effectively, that when Venus is close to the Earth, it is the third brightest object in the sky, exceeded only by the "Sun" and the "Moon". Mariner 2, that did a fly by in 1962, detected a ground temperature of 600+ 0F. and was unable to detect any weak magnetic fields. The atmosphere on Venus is nearly all carbon dioxide, that exerts a pressure at the planet's surface equivalent to 100 times that of "Earth" at sea level. A day on Venus is equal to 117.4 "Earth" days. 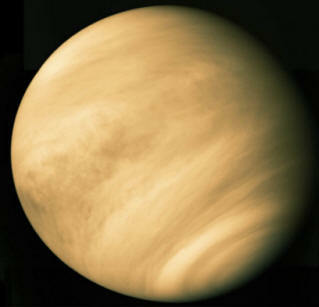 A part, or portion of Venus will receive sunlight for 58 days and will be in darkness for 58 days. Some winds on Venus have been measured from light to 200 miles per hour by the 1978 U.S. Pioneer probes.